Contact objects in an Office 365 environment contain customer or supplier information. This information is vulnerable because it's easily accessible to all users in your organization. For instance, it's quite possible for any user in your organization to modify the email address of your supplier inadvertently. 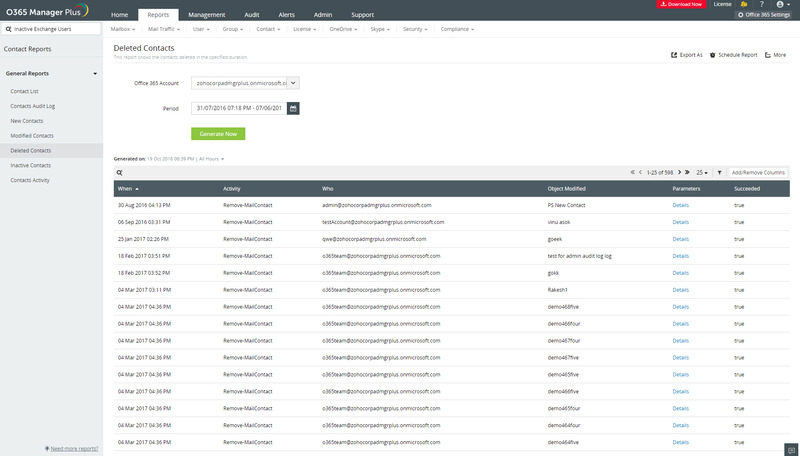 Gain valuable insight about all activities on your contact objects with O365 Manager Plus' contact reports and restrict any unscrupulous activities. 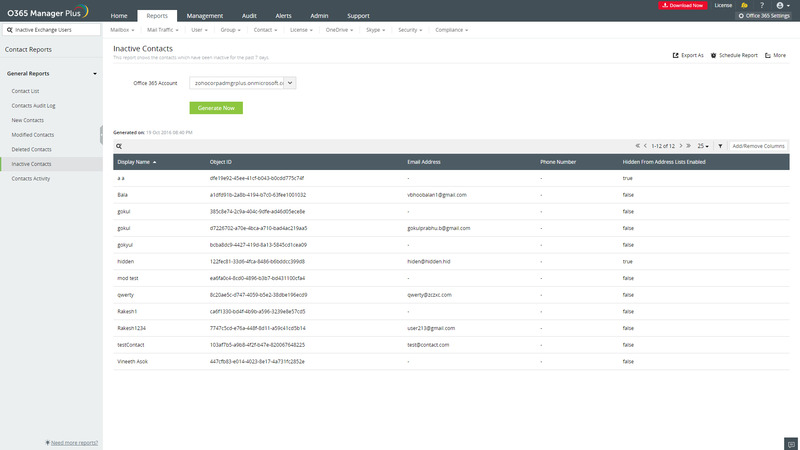 View all the contacts in your organization, including information such as display name, object ID, email address, mobile number, and more. Get a comprehensive overview of every contact created, modified, and deleted in your Office 365 environment, along with details on who performed what and when. Get details on every contact object created in your organization, including details on who created it and when. Lists all contacts modified by users in your organization. You can also see details about the operation type. See information on all contacts deleted from your organization's Exchange Online environment. Displays contacts with whom you haven't had any email communication for the past seven days. 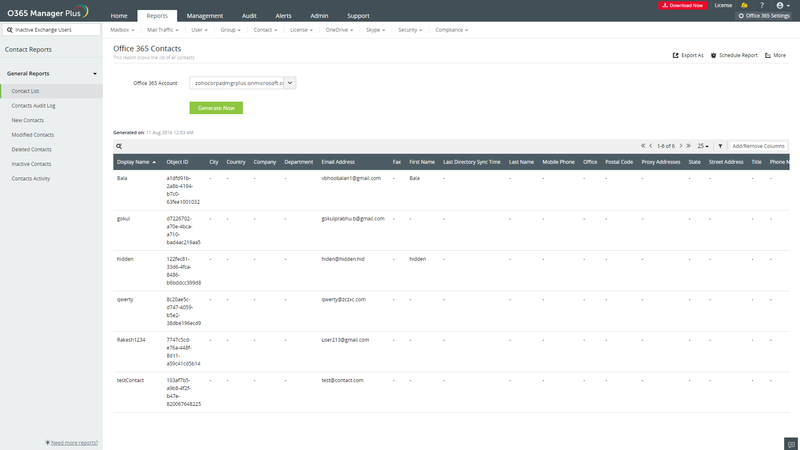 Keeps track of all emails sent to and received from the contacts in your organization, with information on the object ID and name of the contact, the sender and receiver details, and more. These contact reports can be scheduled to run at fixed intervals, emailed to administrators, and exported to multiple formats such as CSV, XLS (Microsoft Excel), PDF (Adobe Acrobat), or HTML. You can also embed these reports in another webpage to share information easily. O365 Manager Plus also provides built-in filters to pare down your contact reports reports so you see only the information you want. 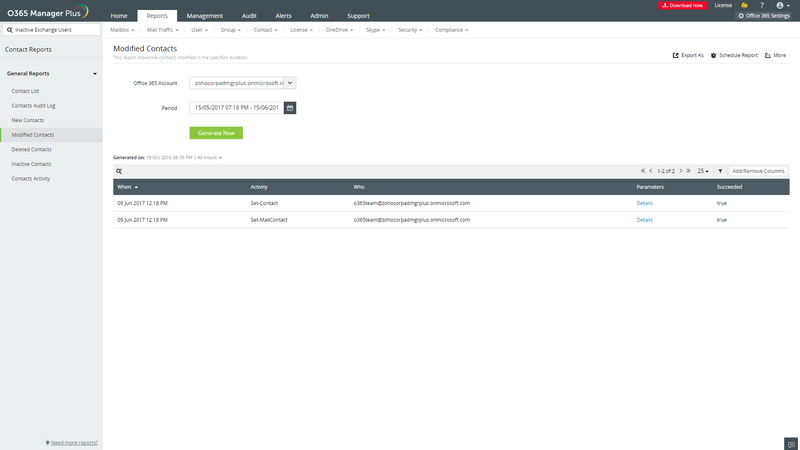 You can also save this information as a separate report to be viewed alongside other preconfigured reports. Your contacts, be they supplier or customer, are indispensable to your organization. Therefore, you must keep their information secure. 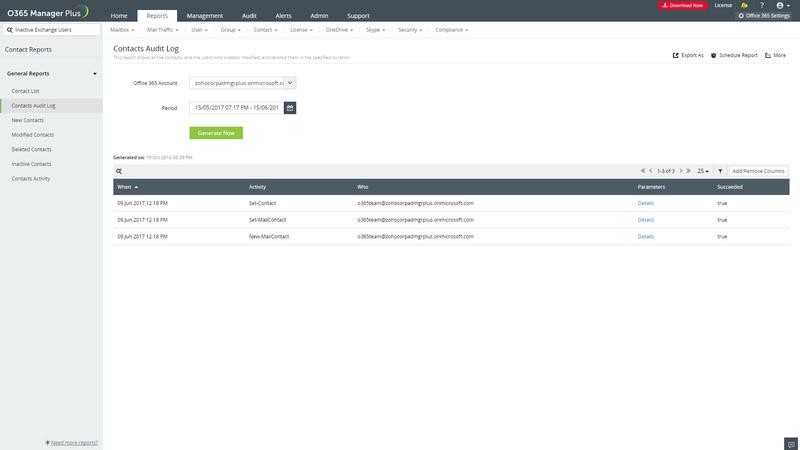 With O365 Manager Plus, you can monitor, audit, and report on every activity that involves a contact object and ensure its security.